Louie, who did our gutters, came by yesterday and installed the last of our downspouts. Rick was also out yesterday afternoon and got the kitchen tiled, including all the appliance bays. Lots of finicky corner- and edge cuts, plus he had to deal with the floor transition. When Barb and I got home, we spent some time discussing tile designs for the entryway with him. Between the fiddly tile work, the time we spent talking, and the fact that we didn’t come to a decision on the design, the entry didn’t get tiled last night. 1. Laundry/utility room — We ***really*** want to be able to do laundry *at home* again! 2. Bathroom — One of the chores that’s beginning to annoy me is dumping the water from our condensing furnace. Once the bathroom tile is grouted, we’ll be able to install the vanity, and then we’ll be able to plumb the condensation line into the drain system. No more hauling 5-gallon buckets of water, hooray! 3. Kitchen — We’ll be able to install some of our appliances once the kitchen floor is grouted, although we’ll still have to wait for the backsplash grout before we can bring in the new range. Looks like we’ve got a busy weekend coming up. We’ll be putting in baseboard behind some of the appliances (like the refrigerator), and installing as many of the appliances as possible. 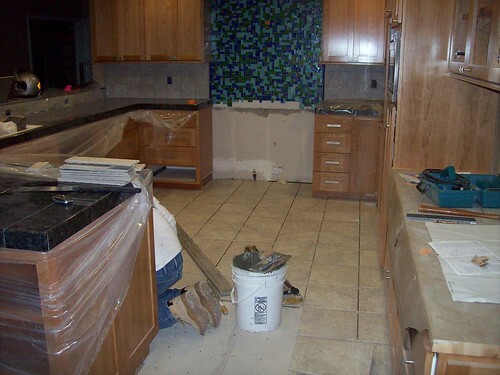 If the backsplash in the kitchen is grouted by Friday, we should have or kitchen up-and-running over the weekend. w00t! 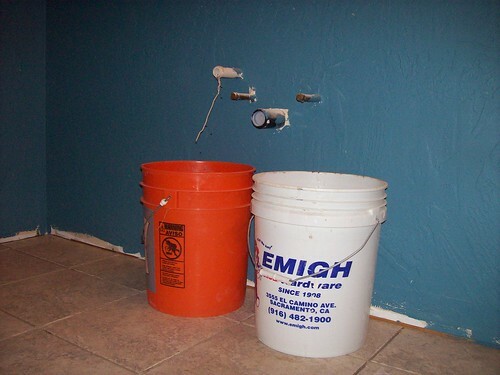 This entry was posted in Our home remodeling project, Uncategorized and tagged gutters, kitchen, tile. Bookmark the permalink.